Ichiro Suzuki deserves to be celebrated for his brilliant career, but despite what MLB said over the weekend he is still a long way from reaching Ty Cobb's professional hits total. One day in the summer of 2010, Ichiro Suzuki arrived for work to the visiting clubhouse at Yankee Stadium, He was still a Mariner then, and he wore a handsome summer suit, olive in color and right off the pages of GQ. He had on small-framed black sunglasses, his black hair was slicked back and he trailed behind him a narrow, black trunk, which he then opened to reveal a few of his baseball bats laid snugly inside. He might have been a young B.B. King arriving at a Memphis blues club with his sweet Lucille, or a 1920s Chicago gangster with a Thompson in tow. To pitchers, Ichiro has been all of that and more: Stylish, precise and dangerous. He went 2 for 4 that day versus the Yankees, a common output for a man who came into the majors in 2001 with a phalanx of Japanese reporters following his every move and established himself, more or less immediately, as the greatest hit-maker of his time. From, that odd, bent, knees-together stance, Ichiro has lashed the ball to all parts of the field. He led the American League in hits seven times between 2001 and '10. He batted better than .350 in four of those seasons. In '04 he had 262 hits, and 225 singles (Ichiro has shown some power but is in true measure a singles hitter all the way) both of those being more than anyone has ever had in a major league season. He always had speed—a threat for an infield hit—and he was wise on the base paths. And, never much one for drawing a walk, he came out swinging from the dugout and didn’t stop. All of this explains why now, as a 41-year-old part-time outfielder for the Marlins, Ichiro has a robust 2,915 career hits. He has been a .267 hitter over the past three seasons but he is still a thoroughbred, still solid in the field (in his prime the guy could seriously pick it, winning 10 Gold Gloves) and still a unique presence in the batter’s box. 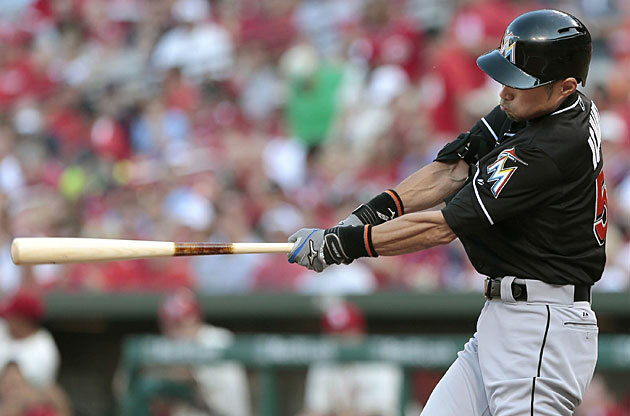 It’s a good bet that at some point next season, wearing a Marlins uniform or someone else’s, Ichiro will become the 30th man to amass 3,000 hits in the major leagues. He is, without question, the greatest player to come from the Japanese leagues to the majors. That’s right folks, and Dewey defeated Truman for the U.S. presidency in ’48! The Ichiro allegation is as pure a piece of poppycock as you are likely to find. Cobb, who is credited with 4,191 major league hits (he actually had 4,189, but by the time that was retroactively determined, in 1981, MLB decided that the 4,191 had been around so long it was iconic and would not be changed) also had 166 hits playing in the South-Atlantic League as a teenager. He was paid for those games, making him a “professional”—a designation that MLB and, subsequently, outside media organizations clung to. That brings Cobb’s official all-time pro hits total to 4,359. Pete Rose, who got 4,256 of his career hits as a major leaguer had another 427 in the minors (yep, he was a pro then too) giving him a career total of 4,683. Ichiro, at his current rate of output would reach that in 2020 or '21. But wait, you might say. Japan's leagues are pretty good! Kinda like the majors, right? Well, consider that during and around Ichiro’s time in the Pacific League, 1992–2000, the MVP winners included Jack Howell, Tom O’Malley and Tuffy Rhodes. Those men all put up huge numbers in their crowning seasons in the Far East, and those men hit .239, .256 and .224 in their respective and itinerant major league careers. Thirteen non-pitchers have come from Japan to play in the majors. Aside from Ichiro and the excellent run-producer Hideki Matsui, they have left little mark. There is a rich and wonderful culture of baseball in Japan, wrought of fine tradition and producing world-class talent, but there is no way to honestly equate, even implicitly, numbers achieved there with numbers achieved in Major League Baseball. Ichiro’s false milestone made for a nice scene at Busch Stadium on Sunday: He got a standing ovation for “professional hit” 4,192, and he saved the bat he struck it with. Ichiro is a great, great player. He is worth standing to cheer for anytime that he comes up. He honors the game and plays it as well as any player we have seen this century, and we’re lucky to have him in our midst. But the idea that he has “passed” Ty Cobb in anything is just a crock.